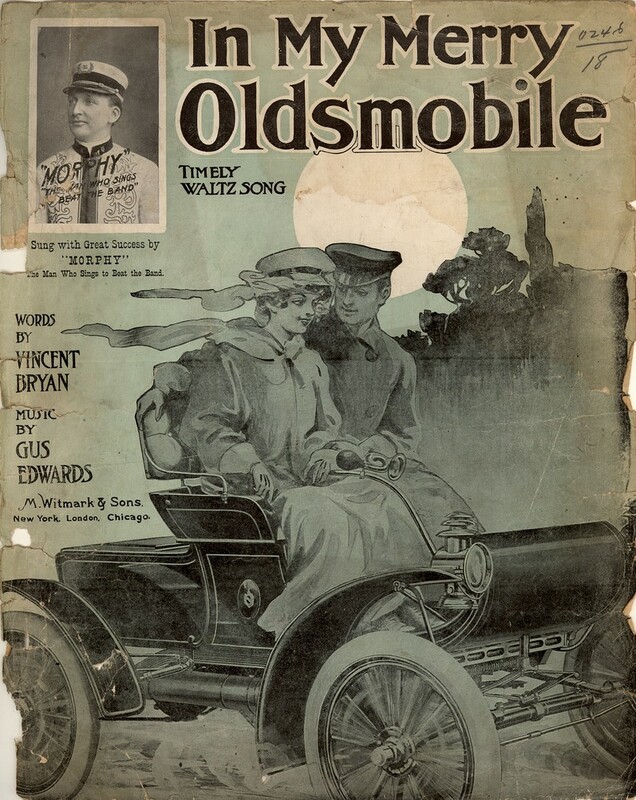 This was the refrain of the extremely popular 1905 song “In My Merry Oldsmobile,” which captured some of the romantic ideas associated with the freedom of the new invention called the automobile. The sheet music of this song featured a couple riding in a curved-dash Oldsmobile, the first mass-produced car, offered from 1901 through 1907. The song was written only two years after the birth of María Lucia Alvarado. It’s tempting to imagine these lyrics had something to do with María Lucia being called “Lucille” throughout much of her life; they certainly express some of her free spirit. She was born in Los Angeles on April 15, 1903.1 Her parents were José María Alvarado (1866-1920) and Jesús García (1871-1966), who had married most likely in Ensenada (probably in the Church of All Saints, Iglesia de Todos Santos, where their children Carlos and Beatríz were baptized2) and immigrated to California in 1899. 3 [Update: They were married in San Diego in 1895.] José María was born in Mazatlán and Jesús perhaps in Ensenada, although she always insisted her mother gave birth to her just across the border, in the United States. José María and Jesús brought with them three children born in Ensenada: Bernabea Beatríz (born June 11, 18964), Carlos Ysidro (born May 15, 18975) and Leopoldo Francisco “Paul” (born January 4, 18996). Jesús Alvarado standing in front of Alvarado Mexican Merchandise, Lankershim. 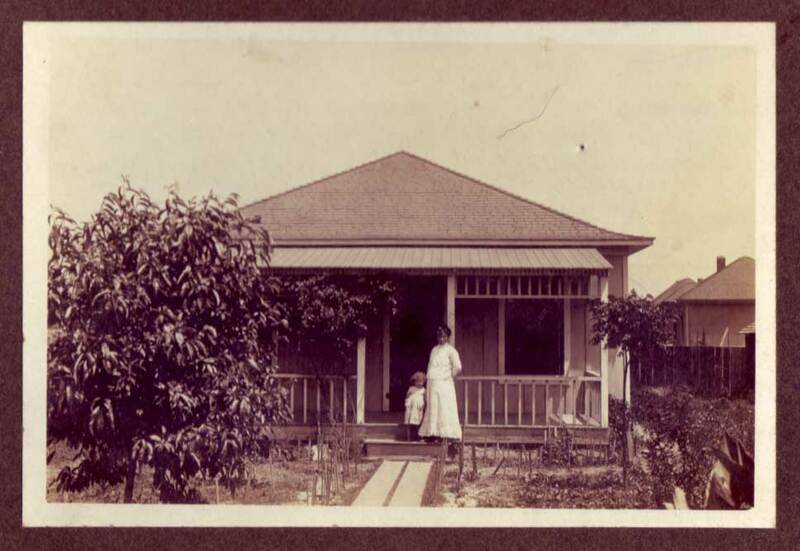 By 1916 the family was living on Fourth Street in the unincorporated community of Lankershim.14 The address was 10939 Fourth Street, an address that would remain in the family records for years to come. It was an upstairs residence above a store that had a rooftop garden and a social hall in the back the family would rent for weddings and other occasions.15 On the ground floor Jesús would establish a business called Alvarado Mexican Merchandise, probably after the death of José María. 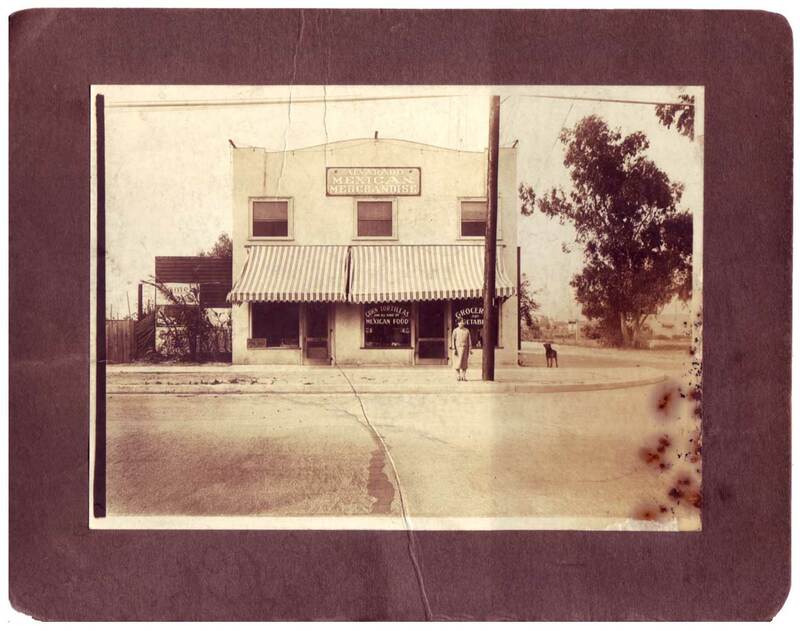 On the annexation of Lankershim to the City of Los Angeles in 1923, Fourth Street would become Magnolia Boulevard in North Hollywood. The family store and residence was at today’s 10939 Magnolia Boulevard at Craner Avenue. Around this time the family also had a residence downtown at 543 1/2 Fremont Avenue.16 [Update: I found photos of the house.] It was here that Lucille’s brother Carlos, an artist then employed as a show-card writer at Hales Stores,17 contracted the deadly Spanish influenza, which would cause a worldwide pandemic in 1918-1920 second in levels of mortality only to the Bubonic Plague of the Middle Ages. This particular flu strain was unique in that it claimed its victims from among young and strong adults, as opposed to most other flu stains that preyed on children and the elderly. The entire world was in a panic as death rates spiraled out of control in the great cosmopolitan cities. Up to 100 million people died; about 20 percent of the world’s population was infected. 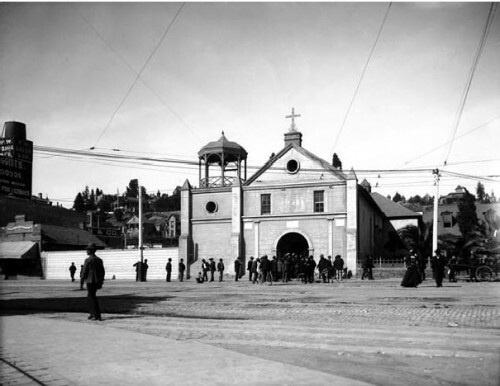 The Goldbaum family was highly respected in Ensenada; Federico’s brother David (1858-1930), a mining engineer, is considered one of the founding fathers of that city and in the last three years of his life was mayor of Ensenada.21 David’s period of mining success coincides with Seth Dunham’s period of disillusionment with mining in northern California. 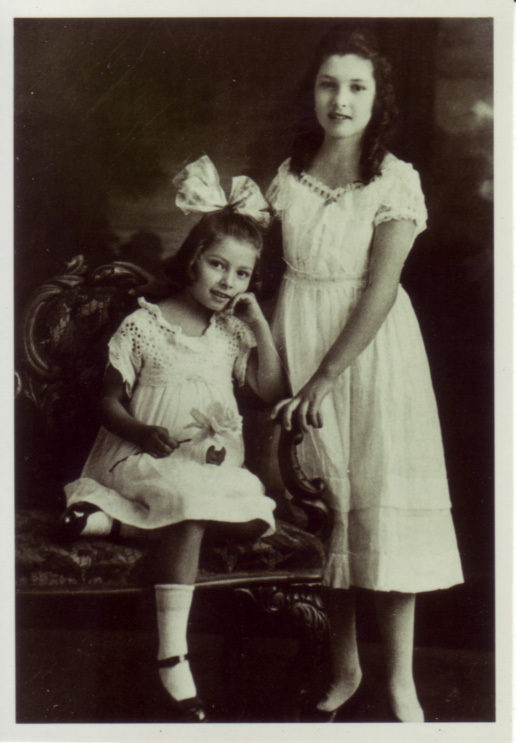 The grand-daughter of Federico and Trinidad by their daughter Beatríz was Virgínia Enriqueta Escarcega, who married into the Hernández-Hussong family of Ensenada (famous for the family saloon known as Hussong’s Cantina, where some claim the margarita was invented) and would remain a lifetime friend of Lucille’s.22 Her aunts Trini and Rose were always very supportive of her, even in difficult times, and throughout her life Lucille would faithfully visit her family in Ensenada. Trinidad’s daughter Enriqueta married the theatrical entrepreneur and ambassador José María Dávila. He was a patron of the famous artist Diego Rivera, who painted portraits of Enriquetta “Queta” and her daughter “Quetita” which are still in the family’s possession today in México City. 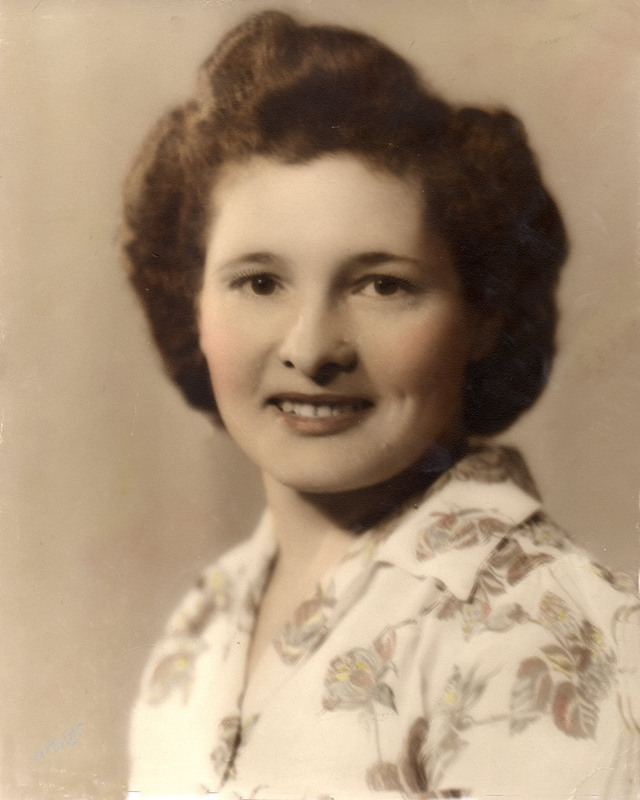 Lucille returned to Los Angeles from Ensenada with a cosmopolitan viewpoint that challenged her family. Her mother was disturbed. Jesús conferred with the widow Minnie Wood,23 her neighbor at 512 S. Fremont Avenue, whose son Willard Vane Wood had recently returned from San Francisco and was living with her.24 At the time, Willard was employed as a bookkeeper with Los Angeles Gas and Electric Company.25 To Jesús, it seemed that Lucille needed some reigning in. Minnie thought her son Willard, born in Iowa on November 20, 1898,26 was the ideal husband for Lucille.27 Jesús agreed, and against Lucille’s wishes, the two young people were married in Los Angeles on February 3, 1919.28 Lucille was 15 years old. At the time of her wedding, her brother Carlos had just died (on January 4, 1919 at the age of 2129) and her father most likely had already contracted the same Spanish flu. As her sister Cecilia described it, there was “death upstairs and death downstairs.”30 Her father, José Maria, would succumb to the Spanish flu on March 21, 1920 at the age of 53.31 This was the macabre setting for Lucille’s unwanted marriage. They soon divorced. Around this time, Lucille was employed in maintaining an apartment building in Los Angeles. 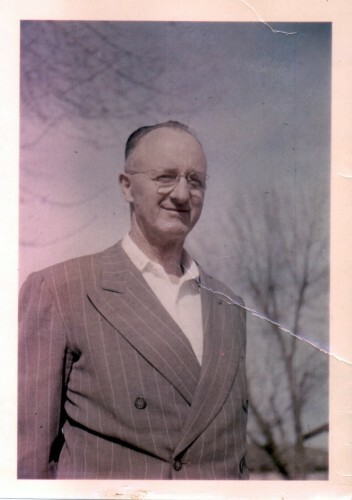 One of the tenants was Sumner Earl Dunham (born April 23, 1899 in Fort Bragg, Mendocino County37), then about 26 and by all accounts a strikingly handsome man. He noticed how hard Lucille worked and how she seemed to be unappreciated by her family.38 He invited her on a date, and on that first date asked her to marry him. Swooning, she promptly agreed. They were married January 31, 1923 February 14, 1923, in San Bernardino. 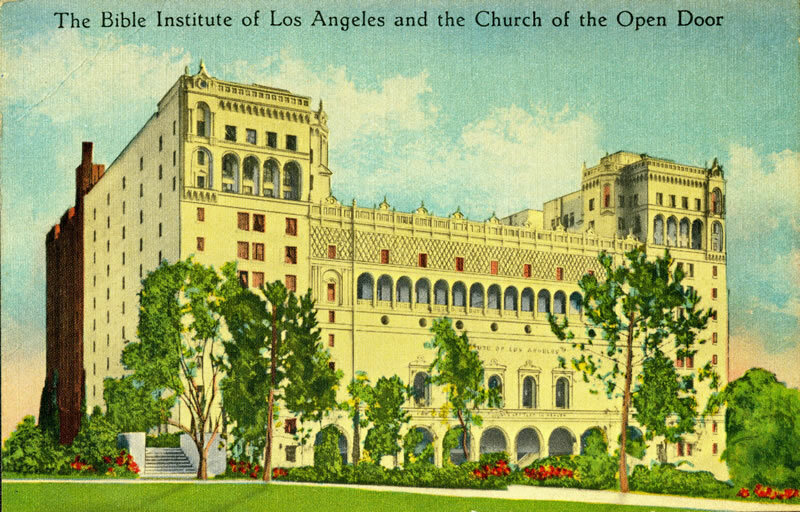 The Bible Institute of Los Angeles and the Church of the Open Door was located on Hope Street, immediately below the Los Angeles Central Library downtown. It was the predecessor institution of Biola University. Image circa 1930-1940 from a postcard in Werner von Boltenstern Postcard Collection, Department of Archives and Special Collections, William H. Hannon Library, Loyola Marymount University. Aram’s caution often precluded him from taking advantage of investment opportunities. He loved to regale people with stories of how he had a chance to buy various plots of land, smiling as he remembered thinking that no one would want an orange grove in a place called Anaheim (now the site of Disneyland) or another grove far from the city center (now the location of the Beverly Hills Hotel). He was never bitter about these lost opportunities, instead he would laugh, amused at his own lack of vision. 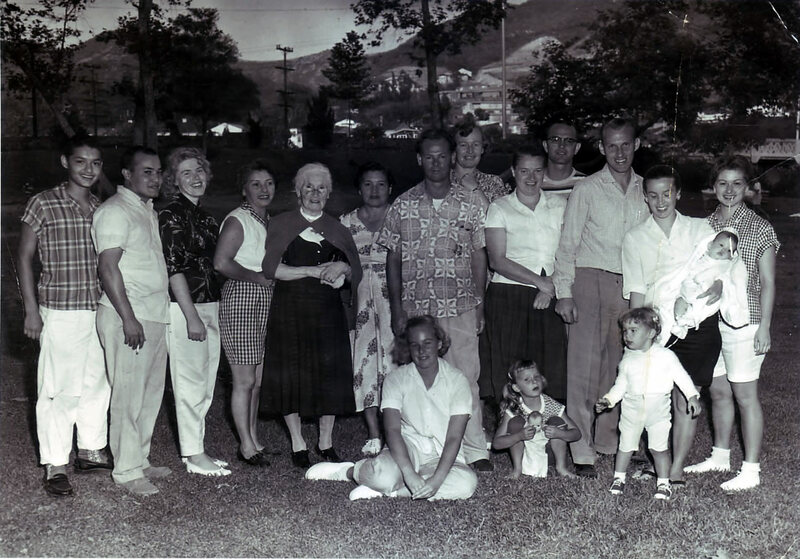 David, Frank, Naomi (Schilling), and Cecilia Hernandez, Jesus Alvarado, Lucille Dunham, Gene and Patrice “Patty” (Dixon) Wood, Virginia “Dolly “Nancy” (Dunham) and Winford “Bill” Tate, Jack Dunham, Suzanne (Dunham) Johnson holding Janice and Yvonne, and Rosemary Dunham. Seated: Eva Lucille Wood and Louise Tate. After Dolly, Jack, Suzanne and Rosemary married and moved away, Lucille and Aram lived in a Craftsman-style bungalow owned by Lucille at 211 Windsor Dr. in Glendale, and Lucille later bought a house and two-unit apartment building at 204 W. Kenwood Dr., also in Glendale. The front house they rented out, and Lucille lived in the upper apartment, while Aram filled the bottom apartment with his finds. Lucille passed her time in this apartment painting and reading, with visits by family for holidays and special occasions. The apartment was decorated with her watercolors and oil paintings, as well as antiques she inherited from various family members and the family’s long-time advocate and protector, Dr. Cecilia Reiche. A visit to Grandma often included a special treat: lunch at the original Bob’s Big Boy on San Fernando Road Riverside Drive in Glendale. During this time Lucille enjoyed her new-found freedom. She had a wide circle of friends. She was active in the Las Amigas Club of Glendale, editing the newsletter, organizing trips and playing canasta. She even took swimming lessons at the Glendale YWCA. Lucille and Aram greatly enjoyed the since-forgotten pastime of “going for a drive,” where they would get into the car and just explore the open road. Often they would set off to visit family members across the state or in Mexico, but just as often they would have no planned destination, following roads on a whim and delighting in what they discovered. Eventually Lucille and Aram separated; Aram rented the house on Windsor from Lucille and she continued to live on Kenwood. Even though divorced, they continued to be friends and companions. It seems they still enjoyed one another’s company, but realized they simply could not live together. For Lucille, her relationship with Aram was tinged by a deathbed promise she made to his mother Louisa to always take care of Aram. Lucille was true to her word. Aram died on February 4, 1990 in Glendale at the age of 8657 with Lucille at his side. The family emptied the Windsor house of decades of accumulated and neatly organized paper bags, string, scraps of wood, old nails and other such things. His brother Arthur inherited the bulk of his estate, as Aram always had a strong sense of responsibility as the elder son. When it became apparent that Lucille could no longer live on her own, she was shuttled to various hospitals and convalescent homes. 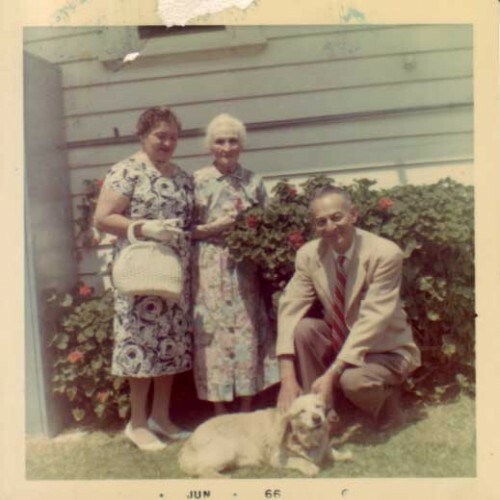 For a while she lived in Alabama with her daughter Virginia, “Dolly.” As a nurse, Dolly was especially suited to this responsibility, and she cared for Lucille with great devotion. Lucille was frail and forgetful; she would often not recognize family members. She also spent time in a convalescent home in Orange County near her daughter Suzanne. Lucille died on May 25, 2001 in Glendale at the age of 98.58 Her funeral was at Holy Family Catholic Church in Glendale, where her daughter Rosemary had been married and her eldest grandson Eric Stoltz was baptized. She was buried at Forest Lawn Memorial-Park in Glendale near Sumner Earl. Throughout her life, Lucille was a non-conformist. She enjoyed life and did not feel constrained by what society felt were appropriate roles for a woman. She was not afraid to work hard to support her family, and she enjoyed whatever she did, whether it was toting a washing machine behind her car, cooking Mexican food all day or spending hours at a telephone operator’s station. Her eyes would shine as she related each of these chapters of her life, smiling as she told her stories. What kept her going was the need to provide for her children at home, and perhaps to get a little time to get behind the wheel of her car and go wherever she wanted, enjoying the perfume of the vast orange groves that lined the roads of her California and the simple pleasure of stopping to pick a bunch of grapes from an unattended vineyard along the way as she drove without a plan, merely to savor the journey. Even when Lucille could no longer drive, she could not bear to sell her beloved 1984 Chevrolet Celebrity. The car sat gathering dust in her garage on Kenwood. It was the end of an era for her, the loss of her independence and an unconquerable spirit that had led her through so many hardships. Though often disappointed by the men in her life, she remained devoted to her extended family and friends, and open to new experiences. She was never afraid to try anything. Did Lucille’s life-long nickname come from the old song? Perhaps an answer lies in the last days of her sister Cecilia Alvarado Hernández Kirkman. In the months before her death in October 2008 at the age of 99, when she often could not remember her sister or other family members, Cecilia would be heard softly singing “Come away with me, Lucille…” You can almost see Lucille behind the wheel of her car, flying down the road of life. María Lucia “Lucille” Alvarado Wood Dunham Minasian is my grandmother. Eric, Excellent. Grandma’s father Jose Maria Alvarado is buried at an unmark grave at 6000 Santa Monica Boulevard in Hollywood. Great grandmother Jessie is buried at San Fernando Mission Cemetery. My mid 1970s family history project went to Aunt Dolly Tate in late 1991 before I moved to Albuquerque, New Mexico. Anything on Aunt Jovita who moved to New Zealand ? I met her once when she and Grandma visited our 3500 Prospect Avenue home in La Crescenta. You certainly did your homework. Eric: Jessie (nee Jesus) Garcia was born in San Diego, California. thanks, Eric, for dispelling the mist of secrecy which has long shrouded our family past. 1. My grandmother, JG Alvarado, the first born child of Rosario related to us that she was born on the banks of the Tijuana river when her mother was rushing to the nearest hospital in San Diego. She always maintained that she emerged on the north bank, which would have made her an American citizen by birth but there was no proof. So in the early ’50s, still barely able to speak English, she took the citizenship test assisted by my brother Frank and was sworn in officially as an American. 2. Your grandmother, Lucia, once confided to me that she was born in Ensenada and was in fact, Mexican. I do not know where Mercedes was born. She is buried next to her brother Carlos and her Father. 2a. In 2003 I escorted my mother to Ensenada for her final visit with cousin Virginia. Virginia took us to the graveyard where her grandparents’ headstones were clearly visible from the street giving the dates of their deaths. 3. In 1990 cousin Dolly showed me the original marriage license for JG and Jose Maria Alvarado issued in San Diego and dated 1899. Hand written neatly at the bottom were the birth dates of all the children. We both remarked that Carlos’ birth date was exactly 9 months and one day after the wedding date. 4. Aunt Lucille told me that my mother Cecilia was born on Market St. in Boyle Heights, delivered by Dr. Cecilia Reiche. 5. Uncle Aram bears the distinction of being the first Armenian to settle in Glendale. I guess I’m getting old but I honestly don’t remember a Bob’s Big Boy on San Fernando Rd. in Glendale. There was a diner just down the street from your grand parents’ home across the street from the main post office. I enjoyed many a spaghetti size there working the Christmas midnight shift while attending Loyola U. The original Bob’s Big Boy was located on East Colorado St., walking distance to Glendale High School.